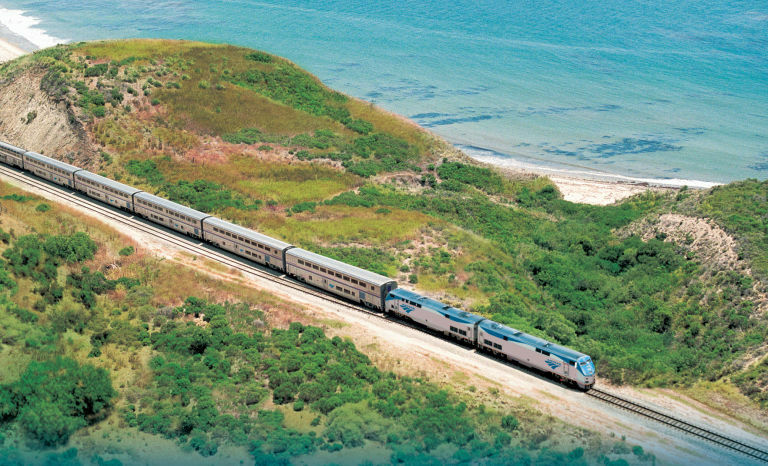 Hands down, one of the best (and cheapest) ways to see America’s vast beauty is by train. Don’t believe us? Then allow us to introduce you to Amtrak’s Coast Starlight, which has been called “one of America’s most beautiful train rides” since the 1940s. Starting in Seattle and ending in Los Angeles, the Coast Starlight train trip takes passengers through Washington, Oregon, and California, allowing them to see stunning views of the West Coast’s mountains, forests, valleys, and the Pacific Ocean. Passengers can take in the sights from the observation car, which is decked out in floor-to-ceiling windows and comfortable swivel chairs. And here’s the best part—tickets for the spectacular journey start at just $97. The entire route takes 35+ hours and travels through 30 destinations, including Olympia-Lacey, Portland, Sacramento, the San Francisco Bay area, and Santa Barbara. On the trip, riders will see the Cascade Range, Mount Shasta, the Santa Barbara Channel, several national parks and forests, and, of course, the Pacific coastline. The views on the Coast Starlight are unsurpassed. Step into the Observation Car with this 360 degree experience. When booking your trip, you’ll want to consider all the options. Travelers can opt for the $325 “Superliner Roomette” tickets, which come with a bed for overnight travels and your very own sightseeing window in your cabin. Business-class tickets also come with amenities like on-board wine and cheese tastings. And everyone over 62 should take advantage of the special discount for seniors—you can save 15 percent on your next adventure!